Welcome back to Scion’s School! Today we are going to discuss the common deck archetypes that make up most Eternal decks. Identifying what kind of a deck your opponent plays is a key part of deciding how you should play your deck against it. Depending on who you ask, there can be as few as two or as many as nine different archetypes that you can fit a deck into. In fact, there are a lot of competing viewpoints on the matter! That’s OK, though, because here at Scion’s School, we’re dedicated to showing you the one True Way(™). Let’s start with the two basics, the extremes: Aggro and Control. Aggro decks, or aggressive decks, are proactively trying to reduce your health to 0 as fast as possible. These decks run cheap, fast cards on the low end of the power curve (which is to say, they tend to have a lot of cards costing 1-4 and few cards higher than that). I’ve spoken before on the strength of this style’s focus – The strength of an aggro deck is the ability to put the opponent on the back foot, forcing bad blocks or inefficient spell choices in order to protect that most critical of numbers, the life total. If you’ve seen my Eternal Basics, you know that we teach Aggro first because a proactive approach is the simplest, and often the best, solution to the problem. To paraphrase Day9, “If your opponent is trying to do a weird strategy – or any strategy at all, really – often times the best counter is just go kill them.” Aggressive decks win against slower decks by killing them before they can get to their biggest, scariest cards – a highly effective strategy in Eternal. Control decks are reactive, rather than proactive. They want to win, but they’d rather do it on their own time. Control decks aim to exhaust the opponent of resources, pushing the game into a turning point where the opponent’s hand and board have dwindled to uselessness or where the size and strength of the Control decks cards vastly outpace the opponents. To that end, Control decks leverage high value, high cost cards, emphasizing card advantage and inevitable engines. You’ll know a control deck because it will mostly play removal, card draw, and defensive units early, or nothing at all. A control deck might spend turns two and three doing nothing, Harsh Rule the entire board turn five for a huge swing in card and board advantage, then play a single big unit and spend the rest of the game removing everything in its path. Since control decks attempt to force the game to go long, and require many important decisions to be made, they are often viewed as more skill intensive to play, which is true to an extent. If you wanted to look at the game entirely through the axis of Aggro vs Control, slow vs fast, proactive versus reactive, that would more or less be a legitimate method of defining your deck on a spectrum. And it’s important to feel out this spectrum, because the question of who the more Aggro deck is in a matchup is an important one. An Aggro deck has a very high chance of beating a deck that is miles slower than it because it can kill the opponent before the opponent can capitalize on all the cards in their hand. But as the decks draw closer together on this axis, it is the more controlling deck that gains the upper hand. This is because a deck that is only slightly slower than an aggro deck can react to the threats of an aggressive deck fast enough to live, while also leveraging their better card advantage and running the opponent out of resources. Because it’s better to be either slightly slower or much faster than an opposing deck, decks usually focus on a particular power curve anywhere between the most aggressive aggro and the slowest control. You’re not going to see a lot of decks running Oni Ronins and Pyroknights at 1 power as well as Sword of the Sky King and Icaria, The Liberator at 7+, because that kind of scattershot approach means your deck will be both unreliable early against fast decks and bad at topdecking late against slow decks. The important question to ask when playing against a deck is “Who is the beatdown?” If two aggro decks are up against each other, the one that is slightly slower can still lose if it mishandles it resources. It it plays only to kill the opponent and does not block or trade with the opponent, the faster deck can have an opening to win. Likewise, if a control deck has a more powerful top-end than your’s, your best chance at victory is to press your advantages and take a few risks in order to kill your opponent before your cards run out. In a stable board state where each player is just playing a card a turn, the person with the bigger cards wins. So the person with the smaller cards wants to win before the board completely stabilizes. The player with with the larger cards wants to stabilize the board so that they can take full advantage of the power in their deck. Misplaying your role can be fatal when the difference between decks is small. OK, so, we know it’s sometimes best to be slower than an Aggro Deck, but not as slow as the slowest Control Deck. To that extent, we’re going to need to add a little more subtlety to the mix. Time to turn on the Darude, because we need to talk Titans. Midrange decks are defined usually by a desire to skip past the early game and get into the beefy, middle game units. To that extent it often utilizes a little ramp or removal to get into the 3 to 4 drop range, and then consistently plays threats between turns 4 and 6 the way an Aggro deck would, with an eye for killing your opponent. Most midrange decks are creature decks, but they can also be burn or relic weapon oriented. Midrange decks have curves that look the most like a standard Bell curve – lots of good stuff in the middle, only a few cards at the bottom or top end. Midrange strategies are notable because they’re very reliable in some respects – they feature all of the redundant threats of Aggro without falling prey to a bad hand ruining their curve. Against Aggro decks, they play defensively, recognizing the beatdown and working to overcome it with sheer advantages in size. Against Control decks, they play aggressively, trying to kill the opponent with hardy, difficult to remove units and keep them on the back foot so that they waste their cards unduly. They can slip in under control decks sometimes and they can be just fast enough to really threaten Aggro, especially with powerful cards like Sandstorm Titan that supplement this type of deck by being turbo-efficient. However, midrange decks can also be too awkward to survive early rush decks or too susceptible to removal to keep board advantage against control decks – finding the balance in the meta is key to piloting a successful midrange deck. There are some decks that attempt to leverage “tempo”, a measure of board presence and power efficiency, to win the game. To that extent, we often identify a deck type somewhat in-between a Midrange and Aggro deck, called a Tempo Deck. These decks often leverage cheap threats with disruptive elements to find a path to victory. Because tempo is both a more general concept as well as an archetype, the phrase is used pretty broadly, so if you don’t want to call a slow aggro deck or a fast midrange deck Tempo, no one’s going to get mad. But it can help for identifying the decks that don’t quite feel like they fit in either category. Well that was easy, right? Only three (I mean, four) archetypes, and we can simply identify any type of deck based on just its power curve. Unless we’ve forgotten something. While it’s useful to have this idea of Control->Midrange->Tempo->Aggro->Control in mind, Eternal isn’t a game of Rock-Paper-Scissors where Paper mostly beats Rock except those times when it gets a nut draw. You can measure overall card advantage and come to some basic conclusions, but the thing about cards is that they all, in either large or small ways, change the rules of the game. And when the rules of the game are different, different cards are better than others. To that end, a new deck archetype emerges – that of Combo. Combo decks rely on synergy between cards, combining cards to create massive spikes of advantage. Previously, these decks were defined by lethal damage to another player, but that’s a very strict definition that should be taken with a grain of salt. In reality, any two (or more) cards that generate more advantage together than they would alone can be loosely called a “combo”. What makes a combo deck is when the combo in question is a central victory condition. If you don’t have the ability to kill the combo, bluffing the answer can sometimes stall. Say your opponent is running a Recurring Nightmare/Haunting Scream deck, and you’re playing a Combrei Tempo deck. If you do nothing but play out your units, you know that Recurring Nightmare’s doubling attack will kill you in two or three turns. But if you leave two power up to represent a Desert Marshal, your opponent may not even want to play the Nightmare and you can work on punching their clock for a while unimpeded. I recommend this type of evaluation against any deck – figure out what the strategy is, determine how you win or lose, and then start building your path to victory. But against combo in particular understanding what your opponent is trying to accomplish is a great way to prevent losing to it. If you’re going to talk about deckbuilding, you should know the following five words: Aggro, Combo, Control, Tempo, and Midrange. They’re helpful in describing a deck to others and understanding a deck when it is described to you. But remember that they’re just archetypes – not every midrange deck is the same, nor every control, nor every tempo-midrangey beater deck with a one-of combo finisher. Indeed, they can be mixed and matched somewhat! In addition, understand what your plan to win is and whether or not it changes based on your opponents deck type. Try to identify who the beatdown is and what the method of victory is for each deck that you face on the ladder, and play out your cards and press your advantages accordingly. That’s it for today! 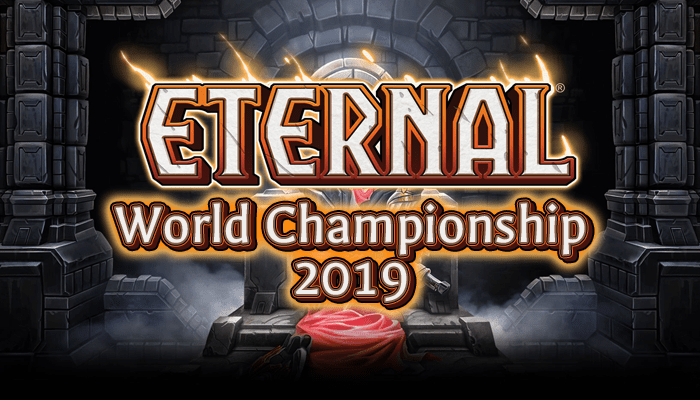 Tune in next week for another Eternal Brews, our regular silly brews column, followed by another Scion’s School two weeks from now. May the deck stack ever in your favor! Next Post: Announcing the Inaugural Eye of Winter Classic! Where do mill decks fit in all this? But in all seriousness, Mill can be control, combo or aggro – it’s just a different method of measuring your opponents clock, where they have 75 health instead of 25. And you have no cards to damage them. Except that one stranger. Which they took out. This is the first article I’ve read on the meta of Eternal and it’s a pretty good one. I knew of aggro decks but didn’t really have a name for the other different types. Let me ask you this: I made a rather large deck (around 125) that’s primarily blue and yellow with lots of draws and cards that make others cost less with the intent of playing the scions and other large cards. What would you call that? Combo-control? Also: if I told you the contents of the deck, do you think you could help me optimize it? I really like it, it just needs some trimming down and more control. Also: what is a card mill deck archetype?